Vitamin C is an essential nutrient required by the body for the development and maintenance of scar tissue, blood vessels, and cartilage. Vitamin C is also necessary for creating ATP, dopamine, peptide hormones, and tyrosine. As a powerful antioxidant, vitamin C helps lessen oxidative stress to the body and is thought to lower cancer risk. High vitamin C foods include guavas, bell peppers, kiwifruit, strawberries, oranges, papayas, broccoli, tomatoes, kale, and snow peas. The current daily value (% DV) for vitamin C is 90mg. 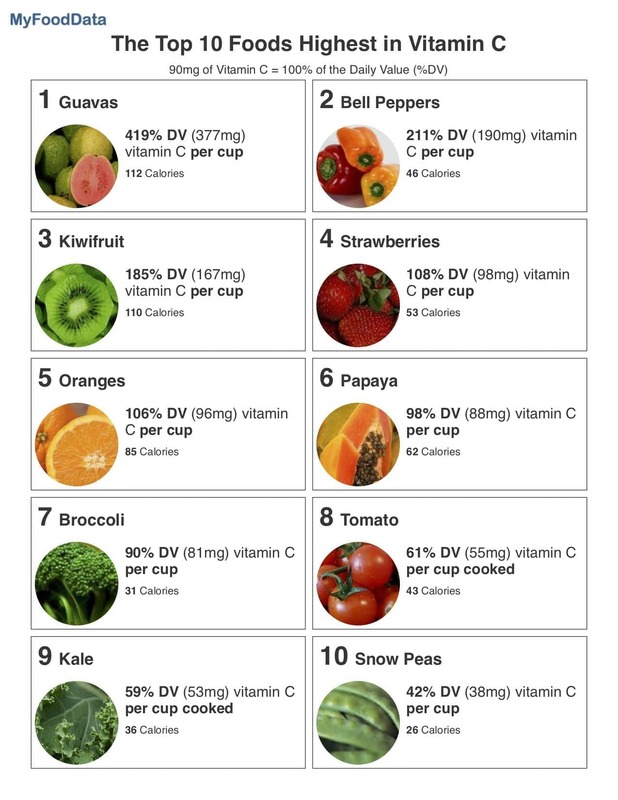 Below is a list high vitamin C foods ranked by a common serving size, use the nutrient ranking of over 200 foods high in vitamin C to see the foods highest in vitamin C by nutrient density (per gram), or see rankings of fruits high in vitamin C, and vegetables high in vitamin C.
See all fruits high in vitamin C.
See all vegetables high in vitamin C.